This expert introduction explores the life and training of the citizen soldiers of the Greek city states, and how they fought against other Greek citizen armies and against the threat of Persia. Thermopylae, Marathon: though fought 2,500 years ago in Ancient Greece, the names of these battles are more familiar to many than battles fought in the last half-century, but our concept of the men who fought in these battles may be more a product of Hollywood than Greece. Shaped by the landscape in which they fought, the warriors of Ancient Greece were mainly heavy infantry. While Bronze Age Greeks fought as individuals, for personal glory, the soldiers of the Classical city states fought as hoplites, armed with long spears and large shields, in an organised formation called the phalanx. As well as fighting among themselves, notably the thirty-year Peloponnesian War fought between Athens and Sparta and immortalised by Thucydides, the city states came together to fight outside threats. The Persian Wars lasted nearly half a century, and saw the Greek armies come together to fend off several massive Persian forces both on land and at sea. 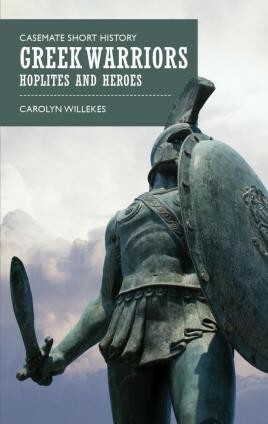 This book sketches the change from heroic to hoplite warfare, and discusses the equipment and training of both the citizen soldiers of most Greek cities, and the professional soldiers of Sparta. What "Greek Warriors” does and does well, is to introduce the major themes of the historic period and touch upon them. Carolyn Willekes writes in an accessible, easily digestible way that allows even the most history-averse scholar to enjoy the book. I would definitely like to read more of her work in the future, preferably a thousand-page epic covering each of the major points in history that she's covered here. Until that's available, this will do nicely. 4.5 stars. I imagine that schools will find these to be useful background primers for a period of history study.